A Los Angeles record producer accepts a lucrative offer to mentor the son of an Indian Billionaire to become a world-famous record producer in this romp through the current realities of the Music Business. There are a great many perks that go along with having your very own Billionheir Intern. There’s the Bentley, the driver, the chef, and of course, the Dishwashing Sikh Bodyguard. But it’s Mixerman’s newfound position as Guru that proves most rewarding. 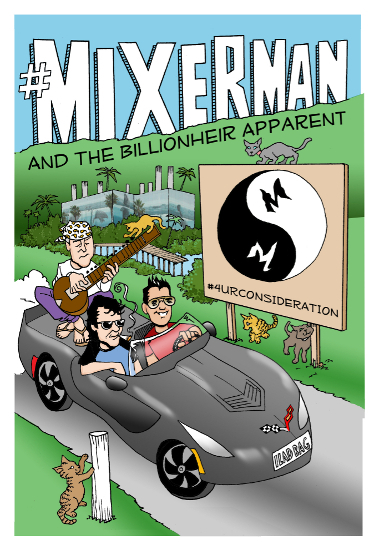 With the Music Business decimated by cratering sales, Mixerman finds himself in the enviable position of being funded, which manifests into an eight-figure Distribution Deal with music mogul Willy Show. There’s just one catch. The team must generate 5 million dollars in revenue on nothing more than a Ditty and a prayer in what becomes an epic race for a hit against a rapidly expanding group of Produsahs and their Billionheirs. In a world where Views and Shares reign supreme, and with so much on the line, there’s only one path to guaranteed success for Mixerman and Kanish. They have to beat Big Tech at their own game. Check out Dr. Dave Walker’s review!